Here you will find forms and deadlines for accreditation to matches at Komplett Arena. Welcome to Sandefjord Fotball and Komplett Arena. We wish to offer good working environments for press, radio and TV at Komplett Arena in relation to SF’s home matches. Therefore, we have outlined some simple rules to follow. Feel free to contact the club if you have any questions in regards to press relations and accreditation. 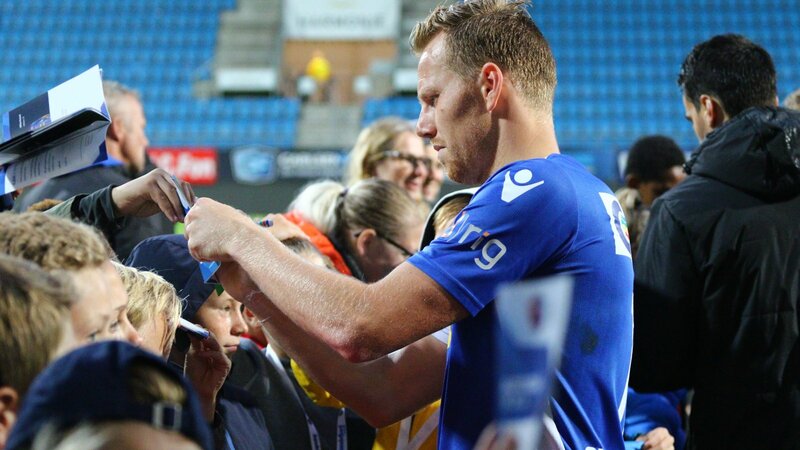 Everyone who wants access to our press zone to work at Komplett Arena in regards to our home matches in the Eliteserien and the Norwegian cup needs to apply for accreditation in advance. The application form for accreditation needs to be at us at least four days before match day. Those who have not sent their accreditation request by the deadline will be shown to the stands. We need full name of the person and employer, phone number, e-mail and what match accreditation is needed for. Accreditation and photo vests can be picked up on match day at the press entrance’s third floor (by entrance 1) at Komplett Arena. The press entrance opens 90 minutes before kick-off. Upon delivery of photo vests, proof of identity must be handed in. Photo vests are to be returned to press hosts in the Mixed zone after the end of the match, where the photographers will get their proof of identity back in return. Media represents who arrive earlier than 90 minutes before the game needs to refer to the accreditation office, by entrance number 3. Accredited press will gain access to the press in-game seating, but not to the technical zone. This is reserved for beneficial owners only plus others with accreditation from NTF in addition to SF’s own security personnel. The press room and the press in-game seating at Komplett Arena is located in the third floor from the media entrance by entrance 1. In relation to TV broadcasted matches there will be held a media meeting for beneficial owners in the media room – third floor at Komplett Arena. From Sandefjord Torp Airport it is approximately 15 minutes to the stadium by car or taxi. If you are driving along European route E18, take the exit road to Sandefjord. Soon after exiting European route E18, you will see a sign for Sandefjord Fotball. Follow the signs for Sandefjord Fotball, who have their offices at Komplett Arena, Pindsle. After having followed the signs you will be driving at Raveien, and need to follow the sign to the left, and you will see Komplett Arena diagonally to the right in front of you. Drive straight down past the first entrance to the stadium and to the right in the round-about along Ringveien. With the back of the Harmonie stand on the right-hand side, the media- and press parking will be situated in front of it, taking off from Ringveien. Mixed zone is, in every home match, situated in the area next to the home changing room, visibly marked. Only accredited press will have access here. Journalists and photographers who wants to go to the mixed zone needs to meet up in the press room and will be escorted downstairs by the press hosts. Players and a coach from each of the teams will be available to all press as soon as possible after the match, with beneficial owners being prioritized first. Only accredited journalists and photographers with photo vests will have access to the press in-game stands and the mixed zone. In the technical zone, beneficial owners and employees from the clubs’ own publications will get accreditation to do interviews, in relation to given beneficial agreements. The WiFi network “SF-Media” covers both the press in-game seating and the press room. Password will be given by the press hosts. Interviews with the players and coaches after warm-up can only happen if special agreements have been done. Only working press have access to the press in-game seating, the radio-/TV platform and the press room. Photographers can only stay behind the goal lines and up towards the 16.5-metre line on the other side of the benches. The press have access to use the press in-game seating and the press room up to two hours after the match. Photo vests give access to the mixed zone and the press in-game seating, but not by walking through the technical zone or the players’ tunnel. We hope you enjoy your stay at Komplett Arena.